It may surprise some of you to learn that Simon and I take a Bollywood Funk dance class every week. We learned very quickly after moving to New York that you can find pretty much everything under the sun in this city if you look hard enough. So I, being a dancer at heart, made it my new year’s resolution to find a brand new style of dance to add to my repertoire. A few weeks after the snow melted and we emerged from our winter slump, I signed up for ten lessons with Bollywood Funk NYC. I’d wanted to try Bollywood dancing ever since Simon and I spent a summer in Dharamsala, India a few years ago, volunteering during the day and enjoying Bollywood music videos over dinner every night. Something about the bright and colorful outfits, the energetic music, and the complete joy radiated by the dancers had me hooked. After watching my first performance with Bollywood Funk, Simon was hooked too. So nowadays, most Saturday afternoons, we attend BFunk classes together at Pearl Studios, in the heart of the Garment District. Now the Garment District is admittedly one of my least favorite Manhattan neighborhoods. Though there are few things I dislike about the city, this neighborhood has them all at the highest levels of intensity: stifling crowds, narrow sidewalks, overzealous cab drivers, air polluted with stale dog pee and steamy trash…In the Garment District, I just find it a little hard to move/breathe/exist. But all that aside, once we arrive at Pearl Studios for dance class, it’s all worth it. Bollywood Funk is a fusion of jazz, hip hop, funk, and contemporary Bollywood dance, which means we get to spend an hour learning some of the most fantastic choreography with an amazing, fun, diverse, and supportive community of dancers. BFunk truly gives life to our Saturdays. And beyond that, it has opened us up to a cultural side of the city that we most likely would never have discovered otherwise. We decided to continue partaking in the Diwali festivities last Sunday afternoon by attending another celebration, this time hosted by the Association of Indians in America, NY. The event was at South Street Seaport, right by the water, with beautiful views of the Brooklyn Bridge and skyline. It was a wonderfully sunny yet very chilly autumn day, with the wind from the waterfront making me wish I'd really bundled up. But we had plenty of Bollywood performances to keep our minds off the weather. 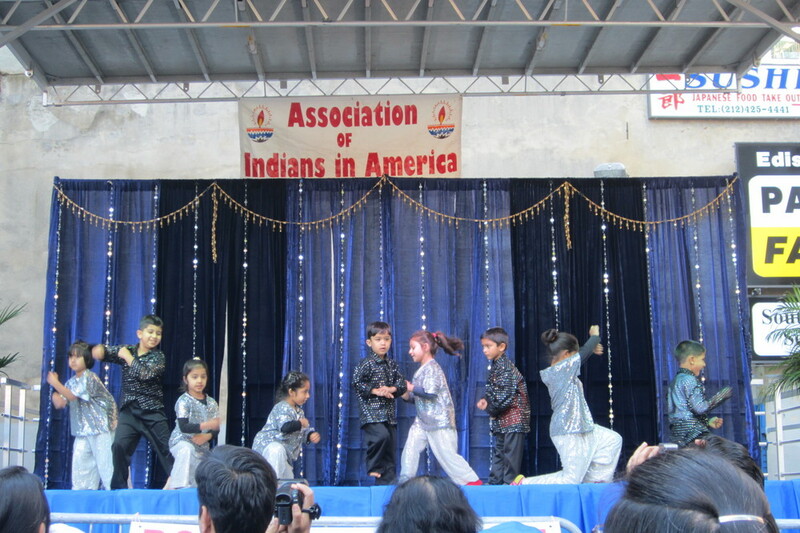 First there were the little ones — four, five, and six year olds dancing to Bollywood beats. This was precious. I teach ballet lessons to this age group at work, so I know how hard it can be for them to remember the steps and have the confidence to perform in front of adults. I had so much respect for the little darlings. Then there was a teenager who looked like the Bollywood version of Justin Bieber, but proceeded to thoroughly surprise us with his dance skills. Bollywood Funk was scheduled to perform around 2, but since the event was running on "Indian standard time", they hit the stage about an hour and a half later. It was absolutely worth the wait though, and by far the highlight of the whole afternoon. They blew us away, and made us so proud!! Finding Bollywood and Indian culture more broadly has made our experience living in New York so much richer. We had work and we had school but now we also have dance. We had concerts and culinary adventures but now we also have Diwali festivals. What could be better? 1. Movies: Yeh Jawaani Hai Deewani. It's got singing, dancing, a love story between two very attractive lead characters, plenty of cheesy lines, and a colorful Indian wedding — all the ingredients for a successful Bollywood film. 2. Food: Try dinner or the lunch buffet at Indus Valley. Though we haven't sampled enough Indian restaurants in New York to claim that this is the best of the best, it's our go-to on the Upper West Side. They make a fantastic chicken korma! Please let us know if you have any questions or cultural recommendations of your own to share! Happy October and Happy Diwali!